The only publication of its kind, Energy & Metals Consensus Forecasts™surveys over 40 of the world’s most prominent commodity forecasters covering over 30 individual commodity price forecasts (list along the right-hand side) including copper. The publication has many practical uses including commodity investment analysis, risk management, corporate planning, and budgeting. A complete sample issue is available by clicking on the box below. 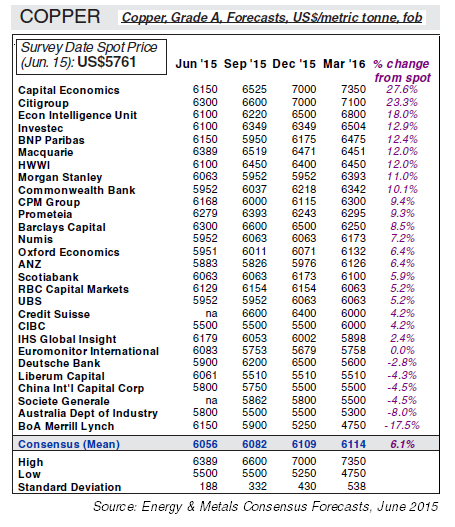 The table below shows a section of copper forecasts from our June 2015 survey, based on London Metal Exchange (LME) cash prices for Grade A copper. The full table shows forecasts for the next 8 quarters. In addition, our panel provide their annual forecasts and long-term projections for the upcoming 10 year horizon. This is complemented with detailed graphical and written analysis. What's currently affecting copper prices? "Expectations of tighter supply in the market have briefly calmed the slide in copper prices. Glencore, one of the world's largest copper producers, recently announced a suspension to its operations in DR Congo and Zambia. Rio Tinto, in contrast, plans to press ahead with new projects, such as expansion of its Oyu Tolgoi mine in Mongolia ..." (Portion of text from the June 2015 issue). More recent forecasts can be viewed by downloading a sample of the publication (link below), which also includes Consensus Forecasts™ for Aluminium, Alumina, Lead, Nickel, Tin and Zinc, as well as ferrous and precious metals. If you have any questions, please contact us at Consensus Economics.